– Improving communication, listening, and interpersonal skills. 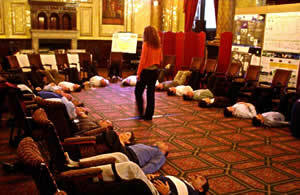 Lorraine McConnon has extensive experience in leading yoga workshops at corporate events of a varied nature. She specialises in introducing mini-yoga classes into the programme of events in a conference setting. – These classes do not require any prior experience of yoga. – Individuals can participate at any level of physical health; effectively practicing the poses and breathing exercises while dressed in normal business attire, even sitting in chairs. Floor work on mats is also available if required. – The programs are offered in the quiet rooms of a conference setting. Lorraine provides all equipment necessary. – Some of the techniques taught can be practiced while the participant is engaged in normal work activities. – It also gives participants a positive method to improve their health afterwards by increasing suppleness, strength and stamina and building resistance to illness. A typical example of a programme for incorporating yoga in corporate events is outlined below. Lorraine McConnon has successfully used this with clients including: the Metropolitan Police, BP, Rothschild’s Bank, Clifford Chance and Goldman Sachs. Details of a specific programme can of course be adapted to suit the needs of the organisers of the corporate event. Early morning optional yoga class (normally this only takes place at off-site residential courses). 10 min yoga class to wake-up participants with simple stretches etc which can be performed at a desk or nearby. 15 min invigoration class, with poses that build strength and suppleness and help with postural re-alignment. During lunchtime, Lorraine McConnon will be available to discuss ways in which yoga can help individuals with concerns such as shoulder tension, lack of energy, insomnia etc. Another opportunity to re-invigorate and to eliminate the lethargy and tiredness that may build up when seated for a prolonged period. Participants will feel recharged and alert after these stretches. Here we will look at techniques for relaxing the mind and body, providing an opportunity to absorb and reflect on the day’s programme of events. Event leaders may choose to use all of the above time slots for yoga in their programme. It is also possible to select just 2 or 3 sessions and of course these classes can be reduced or extended on a moment’s notice, which gives great flexibility for the organisers to keep the day running on schedule. Each participant will go away with poses which they can use later, both at home and at their desk. For more information please email: lrnmcn@gmail.com or call +44(0)7957195618.